Locations include Lincon's Rock, The Three Sisters, Empress Falls, Hanging Rock and much much more. Shoot from "secret" Blue Mountain locations which offer the best photographic opportunities. The tour will start at 2pm on Friday afternoon. Pick ups available from Sydney central to Penrith (please let me know where you would like to be picked up from prior to the tour) From there we will head toward the Blue Mountains and shooting along the way. Check into accommodation before heading to dinner and then an early night. 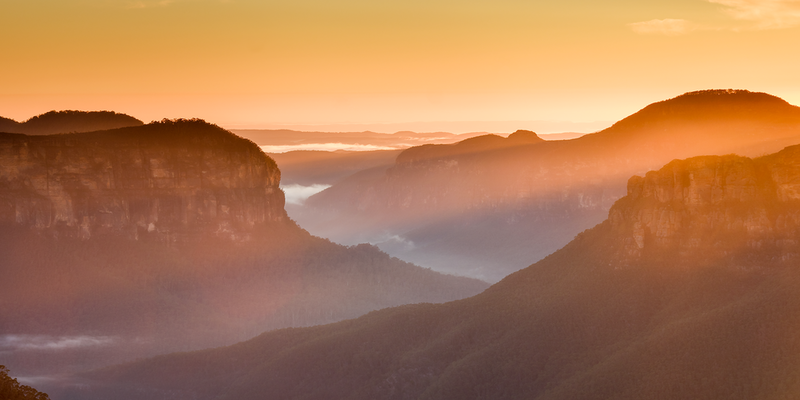 Day 2 starts with a sunrise shoot somewhere in the Blue Mountains, we will sit down for breakfast as a group before before heading out for a days shooting. After lunch we will continue to shoot before finding a location for sunset from there we will have dinner as a group to discuss the days shooting. After dinner we will once again settle in for an early night. Day 3 we will shoot sunrise before checking out of our rooms and having some breakfast. From there we will hit the road to shoot as much of the Blue Mountains as possible. After shooting sunrise we will head back towards Sydney. The tour will conclude about 6pm. 8 photography workshops including 2 sunrise, 2 sunsets, astrophotography (weather permitter), waterfall photography, daytime long exposure and Lightroom/Photoshop workshop (if possible). All transport to and from Sydney in a private car, no need to take your own car. All accommodation your own hotel/motel room. So I can really focus on giving you the best possible photography experience we have limited the tour group size to 4-5 people.